Gennady Golovkin is one of the fastest growing stars in boxing. Some believe he is merely a smoke and mirrors hype job created by HBO, while others are convinced that he is the next best pound for pound king. Let’s look into the Gennady Golovkin story. Golovkin started boxing at 8 years old, and grew into an accomplished amateur. He boasts an amateur record of 345-5, with two gold medals in the World Amateur Boxing Championships, (which alongside the Olympic boxing program is the highest level of competition for the sport). He is also a silver medalist for the Kazakhstani Olympic Team of 2004. Golovkin turned pro just less than a decade ago in May of 2006. Since his pro debut has faced 33 fighters, beat 33 fighters, and knocked out 30 of them giving him the highest KO% in middle weight champion history. He is the WBA Middleweight Super Champion, and the WBC Middleweight Interim Champion, and has defended his title a respectful 14 times. Now the question everyone really wants to get into is “who has he fought”? His last 5 opponents have a combined record of 159 and 13. They include former alphabet title holders, including a super champion, a commonwealth champion, and even most recently a boxino champ. What it does not include, is one boxer that is considered elite. There are a handful of boxers at the pinnacle of the sport that make great fighters look pedestrian. The leap from a great to elite is like the Grand Canyon, and the only way to test if a fighter is elite is by having them share a ring with a member of this small & prestigious club. There have been many boxers whose careers have been built by clever media, and mismatches to artificially create a legend, only to later be exposed. The way boxing is structured, you could theoretically have 100 fights, knock out every opponent, but still be just a club fighter. For every elite fighter there are hundreds that have little skill, and do not follow the strictest of training regiments. Their love for the sport keeps them in the game, with one main purpose. To be beaten by top club fighters allowing them to “look good”. The sports idiom to describe these fighters is “tomato cans” because they just get dented, and leak red fluid when smashed. To be fair Gennady has already surpassed the point of lining up tomato cans, and has been facing top 10 middleweights for the last couple years. The way he decimates the top 10 fighters of his division is what leads people to believe that he will in fact become elite. Gennady cannot be considered elite at this point due to his lack of elite partners to dance with. You can also dismiss the notion he has fought no one, as he has faced top 10 guys, and has appeared as wrecking ball doing so. Another critical observation of triple G, is his skill level, or at least perceived skill level. It has been said that he is a poor boxer, that just happened to be blessed with power, but is nothing special. Or fights with no special effects, as Floyd Mayweather jr. so poetically phrased it. 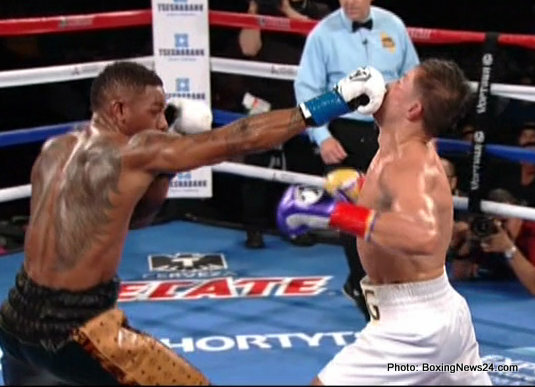 Its true Golovkin does have power; however his primary weapon lies within his footwork. In fact, Golovkin just might have the best footwork in the business. Freddie Roach, who is infamous for downplaying any fighters skills, that may face someone in his stable, has stated just that. “Golovkin might have the best footwork in boxing”. The reason that myself, Freddie and other boxing enthusiasts believe this has to do with a lost art, called shifting. Shifting is boxing footwork that has been virtually unused for around a half century. You see Gennady Golovkin is a pressure fighter, and he wins fights, just as the name implies. He applies constant pressure on his opponent, constantly moving forward, compounding slowly to breaks his opponents mind, and body. There have been many famous pressure fighters, and some have had great success. The catch 22 for a pressure fighter is that because they are moving forward at all times, they are more susceptible to punches themselves. This at times might appear as poor boxing ability, but its just collateral damage for the swarmer ( aka pressure fighter) Having an iron chin is a prerequisite to the job of a swarmer, and it’s even a part of the strategy. When an opponent lands a flush punch with authority, only to see the pressure fighter shrug it off, and continue the march forward you can sometimes see the heart of the boxer deflate like an old balloon. The chink in the pressure fighter’s armor is their feet. In order to land punches with enough pop to contribute to the pressure strategy, their feet must be planted. Slick boxers have long ago figured out, that as long as you get out of the way before a pressure fighter can actually plant his feet, it is very hard for them to be effective. Like a matador taking down a charging bull, they dance to safety delivering pot shots along the way. This is where the lost art of shifting comes into play. Gennady has mastered the art of shifting, and this allows him to actually swing as he is on the move in stalk mode. It also always keeps him in position to fire on his opponent with perfect balance. Many fans have labeled this ability as cutting of the ring without actually noticing how he achieves it. Just as the pure boxer, has created the blueprint to disarm the pressure fighter, GGG has dusted off an old blue print that renders the pure boxer helpless. He has taken this ancient technique and developed it the point where they should rename it after him. The reason he has been able to knock out 20 straight boxers is not so much his power as it is his footwork, or even more specific his mastery of shifting. I can tell you with certainty that someone with such excellent footwork, is not lacking in the skill department. Evidence lies in his over 400 fights, without ever being knocked down, and having only five losses. If you have any boxing experience yourself, I urge you to experiment with shifting. Notice how awkward and hard it is to execute, and then watch how fluid, and seamlessly GGG uses this skill.Its so subtle that you might not even notice it, if wasn’t pointed out. To say Golovkin is lacking in the skill department could not be more false. He might not employ the defensive wizardry that we have grown to love like a Mayweather, or Hopkins, however his mastery of offensive boxing is obvious. No one can predict with certainty the outcome of boxing matches, and this is just one reason why the sweet science is the greatest sport that exists. At any moment a fight can change course in the blink of an eye. One certainty in boxing is that the truth will always come to the surface. Often referred to as the circle of truth, a boxing ring answers all questions. Gennady is a great fighter, with great skill, that has the potential to be a legend; however this will only be revealed after all of the boxing cards have been played. We will have evidence of his ability when he first enters the ring with an elite fighter, and not before. So who will be Gennadys first elite opponent? Just as Gennadys greatness is subject to the boxing cards, so is his next opponent. GGG is waiting on the sidelines, as a Canelo vs Cotto war is being negotiated, in which he is to be the mandatory challenger for the winner. Reality is that guys with the boxing pull of Canelo, and Cotto can break the rules, and do what they please. As funny as it might sound, even a GGG vs Mayweather fight could be in the cards. Has anyone else noticed that Golovkins name seems to be coming up a lot with Mayweathers? Carl Froch’s name has been mentioned, and Golovkins team has reached out to Cobras team. Most recently, even a 42 year old Oscar De la Hoya expressed an interest in coming out of retirement to throw his hat in the ring. The club of elite fighters is subjective, and changes depending on who is talking, however it does appear as though one way or another Golovkin is on the verge of facing an opponent that will answer questions for the boxing world. Speculation at this point would be only that, but one thing that we sure of, is however the boxing cards fall for Golovkin the fans will be entertained. Love him, or loathe him, as the cards are dealt you will be in store for some great boxing action. Lets not speculate, but instead sit back, and enjoy the ride.